Don Milne here, leaving Cedar Point amusement park as Roadtrip-'62 ™ heads out on our sixteenth day of travel along historic US-6. Yesterday, we didn’t travel at all, as we spent the entire day at Cedar Point in Sandusky, Ohio. Today we leave the Lake Erie shore and head inland, through the flat Ohio farmland left behind from the last Ice Age. These plains are the beginning of a vast, mostly flat area that will last nearly to Denver, Colorado as we travel first across the Great Lakes glacial plains through Illinois, then across the Great Plains. Today, we will see some great architecture, a President’s home, connect with an old friend, and discover a few surprises. If you see anything you like, get yourself out on the road and enjoy it in person. This virtual roadtrip is fun, but there's nothing like the real thing! At any time, click on an underlined word below to learn more about the places on the trip. Time to head west across Ohio! Before I leave, let’s have breakfast at the Breakers Hotel here on the point. In 1962, I could have gone to Markley's Restaurant, which was a Sandusky landmark since 1954. They would make omelets to your personal specifications. However, it closed about 2008. After breakfast we can discover that Sandusky, Ohio is more than just Cedar Point. There are several museums in town, including one related to amusement parks, the Merry-Go-Round Museum. Though the museum was only opened in 1990 and is too new for us, it does house a working 1939 carousel. It’s also in a former post office building with a wonderful rotunda entrance area that looks like it was just made for a merry-go-round! This beautiful building is on the National Register of Historic Places. Other museums include the Cooke House, the Maritime Museum of Sandusky, and the Follett House Museum. The Cooke House is an 1840's stone and brick home, built by one of the pioneers of this area who also helped found the Firelands Historical Society in nearby Norwalk in 1857. The home has been preserving local history since perhaps the late 1950s and is restored to its appearance of that period. The Maritime Museum is located appropriately across from the city marina. It houses exhibits on shipwrecks of the Sandusky area, a prison ship, the passenger ships that ferried thousands of visitors out to Cedar Point in the days before the automobile took over, and much more. Finally, the museum I’m going to visit is the Follett House Museum. This was here in 1962, as it began in 1902 in the Sandusky Library’s Local History Room. The museum grew to require a separate building, and is now in the historic Follett House. The house itself is a grand structure, built in the Greek Revival Style and featuring a widow's walk at the top where visitors can enjoy a panoramic view of Sandusky, Cedar Point, and even Johnson's Island. It is home to an outstanding local history collection covering the City of Sandusky and Erie County on four floors. Sandusky’s history has a special connection to 1962, too. That fall the city welcomed home local girl Jackie Mayer, newly crowned as the 1963 Miss America! She visited the Follett House Museum on the 50th anniversary of her crowning and the museum has artifacts from that time. Sandusky’s harbor no longer has excursion ships out to Cedar Point, but it does have ships out to Kelley’s Island in Lake Erie. There are a number of islands north of town. Such islands are rare in this lake but are typical of the northern Great Lakes. The islands are too far from US-6 for our trip, but if you want to reach a bit farther than we will, Kelley’s Island State Park is a scenic place to start. Besides the scenery, you might enjoy the unusual geology or the archaeological features. The geology is largely limestone, which has been quarried since the 1830s. At one time, Kelley Island Lime & Transport Company was the largest producer of limestone and lime products in the world. It was still operating about 1962, but closed shortly thereafter. Abandoned facilities from the quarrying and production of limestone products can still be found on the island. We leave town to the west, but another US-numbered route heads south from Sandusky. Highway US-250 runs to Richmond, Virginia, crossing through the middle of West Virginia enroute. As would be expected, it carries a lot of traffic from the southern part of Ohio to Cedar Point. It is also the main route from the Ohio Turnpike to Cedar Point, as it comes into town closest to the park causeway. But off we go to the west, making our next stop in nearby Castalia, Ohio. Castalia is the home of the Blue Hole, a spring of about 75 foot diameter and no visible bottom, fed by an underground river. There are several of these in the area, where underground streams flowing to Sandusky Bay have dissolved through the limestone rock and formed holes at the surface. This one became famous as a tourist attraction in the 1920s and lasted until 1990, when it closed. It was the perfect quiet, family roadside stop for 1962. At its peek, it attracted 165,000 visitors annually. Some believe the cost to make the walkway handicap accessible was the last straw for an attraction that was no longer making enough money anyway. I remember that when I first visited in the early 1970s, they said the stream that fed the Blue Hole may also be connected to the stream that runs through Seneca Caverns, about 14 miles south of here at Bellevue, Ohio. The Blue Hole is about forty-five feet deep, with a water temperature of 48 degrees; too cold for a swim so it was limited to viewing. The water carries no oxygen, so no fish lived in the pond. However, a series of aerating rapids and a scenic waterwheel on the stream provided enough oxygen for the owners to stock the stream with carp. To make the tourist attraction more fun, you could buy handfuls of fish food from a machine and feed the carp. Of course, there was also a souvenir shop, where you could purchase postcards, plates, paperweights, and more with pictures of the Blue Hole on them. After the attraction closed, the land was purchased by the Castalia Trout Club and is now closed to the public. But don’t despair! You can still see a blue hole at the nearby Castalia State Fish Hatchery. This newest of the six state hatcheries opened in 1997 and within a few years opened its own blue hole for viewing. As a plus, you get to see the fish-rearing raceways, both indoors and outdoors. They raise steelhead and rainbow trout, including all of the state's steelhead. If you really enjoy viewing these seemingly bottomless ponds, there are similar “blue hole” springs at Palms Book State Park, Michigan, off US-2 and in Wimberly, Texas near US-81. As we head inland from Lake Erie, our next town is Fremont, Ohio, home of the Rutherford B. Hayes Presidential Center. Rutherford B. Hayes was the 19th president of the United States and was born in Delaware, Ohio, which we saw on our US-23 roadtrip. 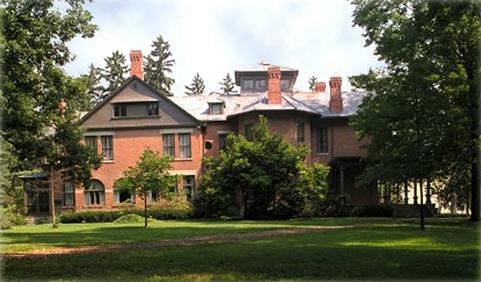 The Center consists of two buildings: the Hayes Home and Hayes Museum. Tours of both buildings are available year-round and the museum is self-guiding. The 31-room mansion was initially constructed by Mr. Hayes’ uncle between 1859 and 1863 as a summer home and Hayes moved in 1873. He lived there for only two years before leaving to serve as Governor of Ohio. He came back to live here after leaving the White House in 1880. While living here, Hayes remodeled the home many times. Additions included a library to house his 12,000 books, a reception room, three more bedrooms, and the modernization to indoor plumbing. One spectacular improvement was a four-story staircase leading to a rooftop viewing room offering a 360-degree view. The other building is more recent, as the Rutherford B. Hayes Presidential Center was founded in 1916: the first presidential library in the United States. Their Prints and Photographs Collection provides for the study of the Hayes Presidency, the Hayes family, and late 19th century America through its collection of more than 100,000 images and other artifacts. President Hayes’ tomb is also on the site. The future president began his political career by being elected to Congress while still in the army in 1864, not taking his seat until the Civil War was over. Hayes was nominated as the Republican candidate for president in the 1876 election versus Samuel J. Tilden. If you think the 2000 election of President George W. Bush was a mess, the 1876 election has it beat hands down! Interestingly, as in 2000, the election turned largely on the votes of Florida. It was impossible to determine who would have won a fair election there, as repeat voting, stuffed ballot boxes, Democratic ballots printed with the Republican symbol (to trick illiterate voters), and delayed and altered returns all came into play. The Republican-controlled state election board eventually threw out 15,000 votes, 13,000 of which were Democrat. Similar shenanigans occurred in North Carolina, South Carolina and Louisana. Both the Republican and the Democrat electors met in these states, voted, and forwarded their conflicting votes to Washington, D.C. In the end, both Tilden and Hayes claimed the same 20 electoral votes so that Congress had to settle the election. While the Constitution provides that the Vice President shall count the votes of the electoral college and announce the winner, President Ulysses Grant had appointed the new Vice President after the previous man died. Many in Congress did not want this appointee to decide, so they disregarded the Constitution and created a special committee to settle the crisis! 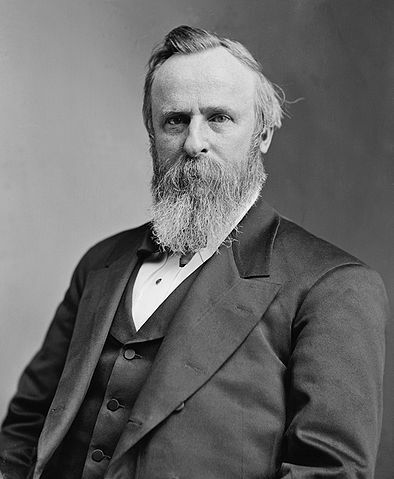 The resulting eight-to-seven majority eventually ruled that Rutherford B. Hayes won the election, but not until March of the next year. In the meantime there was a lot of backroom dealing, filibusters, and even a bill offered to name the Secretary of State as the Acting President until a new election could be held! Ohio has been the home of more presidents than any other state, eight. We previously saw the Harding Home and Tomb in Marion and the Garfield Monument in Cleveland. But enough politics, let’s see what else Fremont has to offer. If you’re here in August, you could visit the Sandusky County Fair. It has been held since 1852, and since 1871 at the present site. The fairgrounds still has three of its original structures remaining: the Commercial Building, the Historical Building and the Secretary's Office. It also has an 1884 barn painted with the Ohio state bicentennial logo. One of the more unusual aspects of the grounds is that the Fremont Speedway auto racetrack is located here. The speedway just completed its 62nd year, so we could have enjoyed both the fair and some races back in 1962. The original track was almost flat and was just over 1/10 of a mile around, but it has been much improved and now offers a semi-banked, 1/3 mile oval. For many years it had one of the few women race promoters in the country, when, after her husband's sudden death in 1962, Dot Stelter decided to continue operating the track. Darl Harrison was the 1960-61 and 1962 track champion, and went on to win the 1969 IMCA Sprint Car Championship, and was the 1971 USAC Rookie of the Year. The Sprint cars are still the main attraction at the track. Enjoy some highlights from the 1962 Daytona 500, a much longer race than any you would see at the Fremont Speedway. One historical tidbit about Fremont is that it was the site of the end of land battles on United States soil in the War of 1812. At Fort Stephenson, Major George Croghan repelled a superior British and Indian force in August, 1813. After Admiral Perry’s victory on Lake Erie the next month, the British never mounted another land attack. We cross our old rival US-20 again here in Fremont. We actually run with it on a bypass around town for about five miles, though sometime before 1962 both routes went right through downtown. After this, US-20 drifts northerly as it crosses the country, while we drift south. We ran together with it for about 30 miles back in the Cleveland, Ohio area and will almost meet it again when we come within a few miles of US-20 in Gary, Indiana. I call it our rival only because it’s now the longest US-numbered route, whereas US-6 originally was. You can tell that Fremont is firmly in farming country by the array of local food products and processors touted by the local Chamber of Commerce. A sampling of products we could have purchased in 1962 and still made today in Fremont includes Heinz ketchup. Heinz’s plant in Fremont was built in 1937 and is the largest ketchup factory in the world, annually producing over 34 million cases of the condiment. The Fremont Company is another major food processor, canning or bottling sauerkraut, salsa, barbeque sauce, and even ketchup under a variety of private labels. They produce both the Frank’s and Snow Floss brands of sauerkraut and have been in business since 1905. Welly’s is another local company using local produce. They make a variety of sauces and seasonings, mostly based on horseradish, and have been producing these in Fremont for over 50 years. Roots Poultry is a chicken processor that began as a distributor in 1930. They prepare and sell shredded and cubed chicken and beef, along with chicken broth, mostly as a regional brand. Finally, there’s Hasselbach Meats, founded in 1931. They offer a complete line of fresh pork, fresh beef, homemade lunchmeat, frankfurters, bologna and other items made from area-fed livestock. Their store at the factory also sells other groceries, including Ballreich's Potato Chips. I picked up some Ballreich’s Salt & Vinegar variety and found it was a good chip with a very tangy vinegar flavor. It’s slightly thicker than some chips due to the wavy cut Ballreich’s calls “marcelled”. These have been sold in mid-northern Ohio since 1920 and are made in nearby Tiffin. A great example of a regional brand, which there are far fewer of today than in 1962. After a few museums and a trip to the Blue Hole, it’s time for lunch. I suppose a trip to a local supermarket would provide me with a good picnic from all that local food, but I’m feeling more like a restaurant today. Old-time choices include Woody’s Drive-In, a seasonal root beer stand featuring both lake perch and walleye sandwiches, since Fremont is close to a Great Lake. Other possibilities are Whitey’s Diner or Billy's Restaurant, both little hole-in-the-wall downtown places. Whitey’s has home fries and oversize sausage patties, and there might even be an old diner building hiding in there. Billy’s bakes house-made cheesecake. That’s quite a few to choose from, so I’m sure you will find a place you like. The Ohio farm country may seem slow, and even boring to some of you. But there are little bits of 1962 lurking everywhere. At the Wood County line, we cross US-23, our first Roadtrip-’62 ™ route. However, it was actually somewhere else back in 1962. This road was OH-199 and we would not cross US-23 until about six miles west, near New Rochester, Ohio. Today the numbering is reversed and that location is OH-199. Having driven both, my opinion is that the old US-23 is the better roadway and more interesting too, as it travels alongside the Portage River. Just four miles north of US-6, at Pemberville, Ohio, you could see another fair either today or in 1962. The Pemberville Free Fair is over 67 years old and is one of the last free fairs in Ohio. It’s held in August each year. While the current US-6 takes a freeway bypass to the south of Bowling Green, Ohio, the old road goes straight into downtown as OH-64, so that’s where we are headed. The first stop is at Snook’s Dream Cars, just before we get to town. Snook’s is not old, but the cars and artifacts are. Inside you can find everything from hood ornaments to seat covers, and bug remover to backseat touring games. Even the exterior is chock full of old signs, gas pumps, and other items to recreate some of the feel of a 1940s Texaco gas station. If you go, you will see cars ranging from the 1930s through the 1960s. All the cars on display are in working condition and owner Jeff Snook notes that he and his father drive them around town on a regular basis. So you might just see an early 1960s car driving past you as you drive through Bowling Green! So just what do we see today in bowling Green? We might stop at the Wood County Historical Center and Museum, located in the building of the former Wood County Infirmary. This historic building was originally constructed in 1869 and added to over the years. The museum moved in after the Infirmary closed and tenants were moved to a new facility in 1971. I’m not sure where the Wood County Historical Society was located in 1962 or if they had a museum then. The 50-acre grounds includes many of the old outbuildings such as the Hog Barn, Corn Barn, and Ice House. These buildings were built for the Infirmary’s original use as a working poor farm but were probably not in use by 1962, as the place had become mostly a nursing home in its later years. There are also a herb garden, walking trails, a blacksmith shop, oil derrick, and log cabin on the site. Bowling Green may be the home of the oldest county fair on our entire trip. The annual Wood County Fair is now in its 140th year! The current fairgrounds dates from 1952, with an expansion two years later and again in 1999. One long-time event held at the fairgrounds is the National Tractor Pulling Championships, which have been here since 1967. The Northwestern Ohio Tractor Pullers Association is the host organization, and they trace their beginning to 1962 when they were originally organized as the Wood County Tractor Pullers. There were initially about 20 members, all residents of Wood County, but just two years later they began admitting folks from other counties. That first 1962 tractor pull did not look much like what we think of today, as it was something called a speed pull. A special flat bottom sled was designed for men to step on as it went by, until the weight of the men was too much for the tractor to pull. This type of pulling had problems with men leaving the track during the event and the tractors going too fast for men to step on. Today they not only have the national tractor pulling contests but the event also displays antique tractors and toys. Driving through the heart of Bowling Green, one of the first things you notice is the clock tower on the Wood County Courthouse. This is a magnificent stone building constructed in 1894 in the then-popular Richardson Romanesque style. In a measure of what people did for entertainment before electronic media, an estimated 15,000 people came to Bowling Green for the laying of the courthouse cornerstone on July 4, 1894, including three special trains that carried a total of 3,400 people! The building is topped by a clock with the second largest hands on an American clock, beating the 12.5-foot hands of the New York Board of Trade Building. At 16 feet, they are only second to those on the Chronicle Newspaper building in San Francisco. The building was restored during 1979-1981 and today they give tours. The interior includes large third floor murals, a large amount of marble surfaces, and sculpture. It was placed on the National Register of Historic Places in 1973. Nearby is the former Wood County Jail building which replicates the Romanesque style of the courthouse. 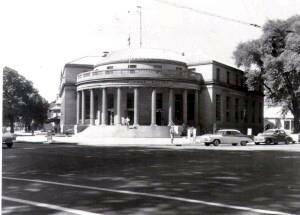 It was constructed of native sandstone and is only a few years newer than the courthouse. It now houses the Wood County Chapter of the Ohio Genealogical Society and other county offices. Around the courthouse are two historic districts, the residential Boomtown Historic District and the more commercial Main Street Historic District. Just as you could in 1962, you can enjoy driving past these antique buildings today. The Downtown Bowling Green organization on East Wooster Street provides maps of driving or walking tours. The Boomtown Historic District has eighteen residences and three significant public buildings highlighted on its tour. It is mostly along West Wooster Street but includes extensions along the side streets. Though the buildings were constructed from 1838 through the late 1890s, the bulk of them were constructed after two disastrous fires that occurred in 1887 and 1888. The money for the larger homes came from a boom in oil and gas wells in the area, which was mostly over by the early 1900s. A lot of money was made not only on the oil and gas, but on other industries that used the cheap fuel, especially glass factories. The same phenomenon of cheap fuel for glass making also occurred at nearby Fostoria, Ohio on US-23. The Main Street Historic District includes 44 commercial buildings and several municipal structures centered around the intersection of Main and Wooster streets. One thing we won’t find here that we would have in 1962 is highway US-25. It used to run right down Main Street, on its way from Port Austin, Michigan to Brunswick, Georgia. But it has been severely shortened by the interstate freeway system. In fact, both Michigan and Ohio completely abandoned the number sometime in the 1970s, so it now begins in Covington, Kentucky. It travels from there about 750 miles to Brunswick. Much of the route was originally part of the Dixie Highway, in the days before routes were numbered. It passes through the historic Cumberland Gap between Kentucky and Virginia. One of the historic buildings downtown is the Cla-Zel Theater, the longest operating first-run movie theater in Ohio. The Cla-Zel Theater opened in 1926, showing the silent movie “Irene” upon opening. After 1941 it was renamed the Armstrong Theater. It retains the original box office in front, the original billboard frames, and the glazed terra cotta ornamentation on the upper story. I hope they make the necessary change to digital projection so they can stay in business. While we’re driving around, let’s stop for some ice cream. Myles Dairy Queen still sports an old neon sign that is no longer standard for the chain. But at one time, Dairy Queens had a wide variety of signs. Most incorporated a cone or blue in the sign, as this one does. Many reviews claim that Myles is different from other modern Dairy Queens in the food also, offering larger portions and a bigger selection of Blizzard and topping ingredients. One other place you might stop is the National Construction Equipment Museum. They were not around in 1962, but they have a nice variety of heavy construction equipment from that year and the era around it. They have operated the museum here since 1992 and have both indoor and outdoor exhibits. They also have a fully-equipped restoration shop, where museum volunteers restore machines both cosmetically and operationally. Here’s a few of the 1962-era machines you could see: a c. 1962 Barber-Greene asphalt paver, a 1961 White Super Mustang dump truck, and a 1959 Cat DW20F tractor with No. 20 scraper. Time to leave and continue west to Grand Rapids, Ohio. Grand Rapids lies a few miles off US-6 and bills itself as a restored canal town. A good first stop is the Welcome Center, in a restored log cabin, to pick up some information brochures. There is also a historical marker telling the story of the floods that have always been a problem. The 1904 and 1913 floods were especially destructive, and in 1959 water filled the downtown in just five minutes! By 1962, this was a pretty run down village, but since 1976 a slow but steady pace of restoration and renovation has made it a tourist town. Another historical marker commemorates Dominick Labino, a local resident who was a glass scientist, engineer, artist, and inventor. One of his patents was for a pure silica fiber used in the insulating tiles of United States’ spacecraft beginning with 1962’s Mercury flights. He worked a long time in the glass industry in Toledo, Ohio and retired to concentrate on his own art glass studio on his farm near Grand Rapids. Due to his familiarity with the chemistry of glass, he was able to formulate his own glass to specific properties and colors. Thus, his compositions have unique colors, textures, and effects. His art works are in over 60 museums in the US and abroad. Across the Maumee River from town is Providence Metropark. The park features the totally restored water and steam powered Isaac Ludwig Mill. In 1971, Isaac Ludwig's grandson donated the mill to the Toledo Metroparks system. Back in 1962 we might have been able to stop in and watch some milling activity. But today you can take a mule-drawn canal boat on a trip down the restored Miami & Erie Canal or walk the towpath yourself. If you cross the river to the park, you end up closer to US-24 than US-6, though still within our 5 mile limit. We run parallel to US-24 until we meet it at Napoleon, Ohio. Just upstream from Grand Rapids is the Providence Dam on the Maumee River at Mary Jane Thurston State Park. The dam was built as part of the Miami and Erie Canal, to keep the water level high enough for boat travel. The dam was first built of wood in 1838 and was rebuilt of concrete in 1908 when the state attempted to pump new life into Ohio‘s canal system. It still looks substantially the same as in a 1916 photo. The Miami and Erie Canal connected Toledo to Cincinnati and joined the Wabash and Erie Canal, which linked Toledo to Evansville, Indiana. Both Lock 44 and Buckland Lock were near Grand Rapids. But railroads took most of the canal traffic and when the canals failed completely during statewide flooding in 1913, they were mostly abandoned. Below the dam the river is shallow enough to walk out into for walleye fishing this far upriver. A good hike is the two-mile round trip from here back to Grand Rapids along the canal towpath, past river views and the old canal ruins. Come along. The next time we cross the Maumee River is at Napoleon, Ohio. We will take the old road into town because US-6 now skirts around Napoleon on a new freeway. Napoleon will be the end of today’s journey. While we’re probably too late to visit the Bloomfield home maintained by the Henry County Historical Society, it doesn’t matter much because they only began work in 1970. Instead, we need to find dinner and a motel and some gas for our Impala. For dinner, I might try Spengler’s Restaurant, which began as a grocery store in 1879 and became a restaurant in 1892. To last that long, they must be doing something right. Spengler’s is still in its Victorian era building, which has been very colorfully painted outside. I see the menu features beer battered, deep fried pickles! Or, if it’s Tuesday I can try their Veal Parmesan and Garlic Bread. For the car, I’ll stop at a Sohio station. Sohio was Standard Oil of Ohio, formed when the federal government broke up the giant Standard Oil trust. Standard Oil was a Cleveland, Ohio company founded in 1862 and run by John D. Rockefeller. By 1878, Rockefeller appeared to have controlled ninety percent of the oil refineries in the United States. In 1890, the first steps were taken by the federal government to break up this monopoly. Laws were passed and court cases tried, but it was not until 1911 that the United States Supreme Court ruled that Standard Oil was a trust and had to be broken up. One of the resulting companies was Standard Oil of Ohio, or Sohio. While we would have seen the brand all over Ohio during 1962, it was purchased by British Petroleum in 1970 and no longer existed by 1991. While at the station, I might be able to pick up a Sohio Vacation Log to help keep track of my vehicle maintenance, sightseeing, and more on our trip. It even has the new Sohio logo that was adopted in 1962. The hardest part is finding a good motel that dates to 1962, as I’m sure I’ve mentioned before. There’s a Holiday Inn Express on the north side of town than has the classic Holiday Inn style. But it’s located at a freeway interchange that didn’t exist in 1962, so the motel probably dates from the 1970s. Zack's Motel was a small one downtown, but it’s closed now. Then there’s the Napoleon Motor Inn, also downtown. It appears to be a few motel rooms behind a house, so it’s probably old enough. And if nothing is good enough, there are some new motels out at the other freeway interchanges. See you tomorrow as ROADTRIP-‘62 ™ crosses into Indiana!